So you’re looking to strike a great deal on electric scooters during this year’s Amazon Prime Day. Lucky you that they have extended the prime day deals to one and a half day(from the normal 1 day). Double luck, that we have created this awesome guide so that you can lay your hands on a great electric scooter at a discount price before it’s sold out. We only list prime day deals that are of value to our readers, if you want to check out all the deals go to this page on Amazon. Hence you will not find any low-quality products in this article. If you need more information on the product you are interested in, make sure to check out our electric scooter section here. There you can find our buyers guides and in-depth reviews. Below are the top deals that are to be found on Amazon during its prime day celebration. The products are sorted on performance and our overall rating. If you want to know more about prime day and how to participate, read below. We update the list on an hourly basis. Prime day is a day of great deals and bargains on various products on Amazon. All shoppers who are Amazon Prime members can enjoy these often heavily reduced prices while shopping for their favorite products. Yeah, you heard it right. They do not only offer their Alexa products at a bargain price. Other products like electric scooters can also be found at a discount during this day. Best of all is that they have extended what was first a full day into a day and a half of amazing shopping opportunities. So grab that cart by the handle and rush to Amazon to strike a deal on some of the most popular electric scooters right now. 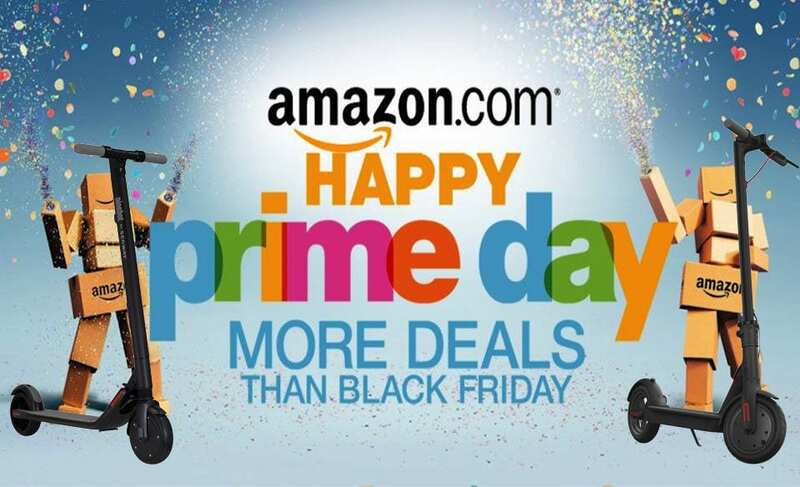 Every year Amazon celebrates with having a day of prime deals. Deals that only prime members can enjoy. The good thing is that even if you don’t have a valid prime membership subscription right now you can easily join in right now and enjoy the full set of deals that are available on this day. If you don’t want to be a member going forward you can always easily unsubscribe and go back to being a regular customer after acquiring the scooter deal of your life. It is simple and well worth the small effort. Oh, did I forget to mention that you can get a free 30-days trial? Cheap electric scooters don’t necessarily mean the product is bad. The products offered during the prime day are often very heavily discounted. This means that even though the product is of high quality it could go at an affordable price. Of course, you should always do your due diligence and do some digging before making the purchase. But do not linger on your decision for too long, you might miss out. The products that we recommend above have all been quality verified and tested by us. We want to get more people into the electric scooter community and together we can make a great impact on the air pollution problems that we have today.